Many people know that Seattle has an old underground section of the city that you can tour but did you know that you can take Port Angeles Underground Tours as well? Located on the North Olympic Peninsula, Port Angeles, like so many towns at sea level, was initially built up … where it really shouldn’t have been. 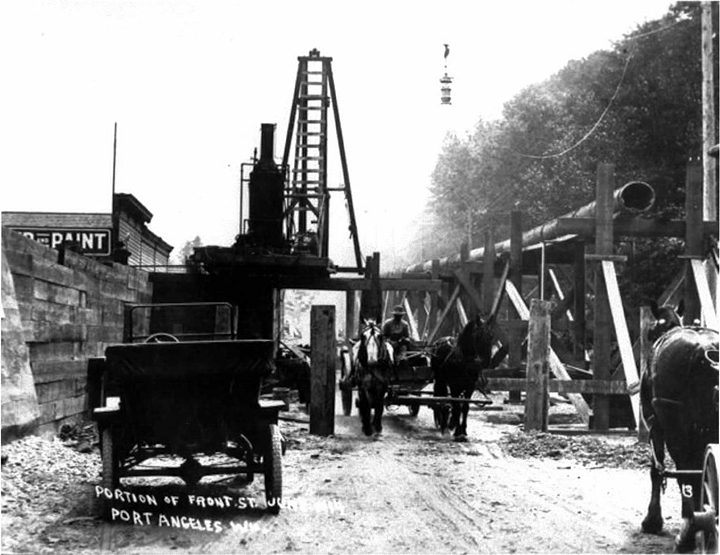 Founded in 1862, with real construction beginning in the 1880’s, Port Angeles sprang up primarily near the water so as to facilitate ease of transport for its main export: logs. Unfortunately, this meant suffering the effects of high tides and what that brought in, namely the growing city’s own sewage! By the turn of the century, it was clear that something had to be done and,in 1914, a series of drastic civic improvements were made. Rather than moving the city sideways, the engineers decided to move it straight up: between ten to fourteen feet off the ground, making the second floor of most buildings at street level. This waterfront elevation was done completely by hand, if you can believe it. Dirt and rock from the nearby hill was sluiced down to the old street level by way of wooden pipes and concrete walls. Many of the existing buildings were simply torn down and built over but others either added a second story or already had one. It is these buildings that retained their old, first floors. First floors that were only fairly recently discovered – and portions of which can now be toured. During your tour, your guide will begin with stories and pictures of old Port Angeles and the waterfront project. Then it’s an easy walk around downtown Port Angeles and its accessible underground, with many points of interest – including remnants of an old brothel! Port Angeles Underground Tours give insight into what it might have been like to live here around the turn of the century and how those hardy people solved what must have been an overwhelming problem with ingenuity and the sweat of their brows. 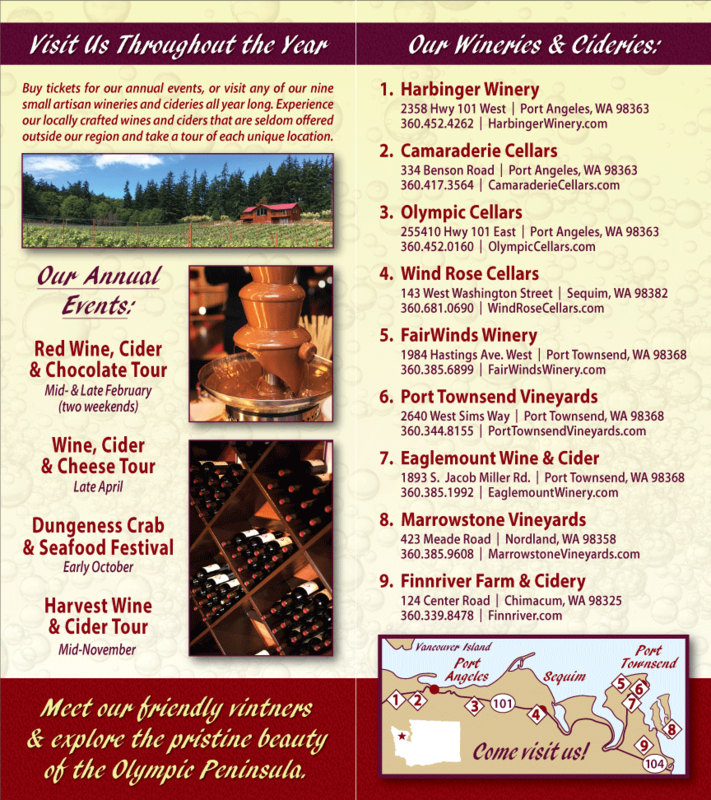 After discovering Port Angeles’ buried gems, don’t miss the opportunity to taste some of its modern ones: nearly all of our our member wineries and cideries are either in the area or easily accessed along the way: Harbinger Winery, Camaraderie Cellars, Black Diamond Winery, and Olympic Cellars, are all in or near Port Angeles. The rest of our members are in the general area and would make an easy and wonderful addition to any weekend or day trip. Come see us and get a taste – or a bottle or two! – of the best that the North Olympic Peninsula has to offer!